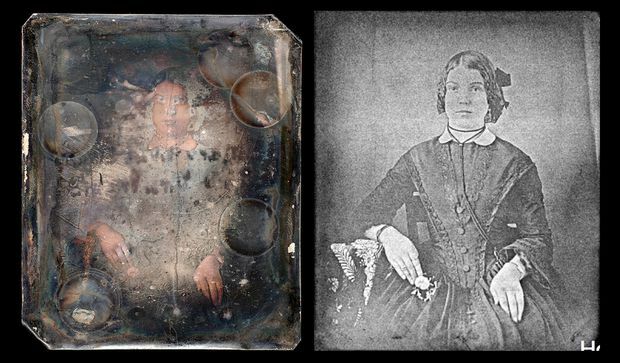 Researchers at the University of Western Ontario used a beam of X-rays to recover the image that lay hidden on a badly damaged daguerreotype. On the left is the image as it appears to the eye. On the right is the X-ray scan that reveals where mercury was deposited on the metal plate when the daguerreotype was originally produced. The anonymous woman stares into the distance, neither smiling nor frowning. With one arm resting on a table, her gaze locks on to her viewers, forming a momentary connection between the 19th century and our own. Unseen for generations, the image was recently conjured up from a badly damaged daguerreotype – an early form of photograph made on a metal plate – that belongs to the National Gallery of Canada. Using an experimental technique that involves firing high-energy X-rays at the plate to map the atoms deposited there, researchers were astonished when the woman’s face suddenly appeared on their display screen. 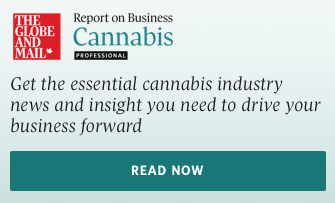 “I think we literally all jumped … it was just such a shock because we had no expectations of what would come up,” said Madalena Kozachuk, a doctorate student in chemistry at the University of Western Ontario in London, who conducted the work. The technique, which Ms. Kozachuk and colleagues developed at the Canadian Light Source, a high-energy X-ray facility in Saskatchewan, could be used in future to glean important details from daguerreotypes that have been written off as beyond recovery. One particularly tantalizing, although hypothetical, application of the technique might come into play if daguerreotypes are ever recovered from the shipwrecks associated with the Franklin expedition, which were lost in the Canadian Arctic in 1846. Historians believe the expedition had the necessary equipment to produce daguerreotypes. Ms. Kozachuk’s results, published on Friday in the journal Scientific Reports, suggest that even daguerreotypes that were damaged by exposure to seawater might be coaxed to reveal what Franklin and his crew saw during their doomed voyage. Invented in the 1830s by Louis Daguerre, a French artist and chemist, the elaborate imaging method soon caught on around the world. Its practitioners focused light on silver-plated copper that was treated with various noxious chemicals to render it light-sensitive. Mercury vapour was then used to alloy with the silver and create a visible image on the plate, followed by more chemicals to fix the image. The plate was then covered with glass to protect its fragile coating. Because the image is formed directly on the plate, rather than through a negative-to-positive process as is done with photographs, each daguerreotype is a mirror image of its subject and also a unique one-off. Ms. Kozachuk’s project arose through her desire to combine her chemistry training with a passion for art and art conservation. The idea came up when she and her graduate supervisor, T.K. Sham, met with John McElhone, the now-retired chief of conservation and technical research at the National Gallery in Ottawa. “My background is in conservation of photographs and it seemed to me that daguerreotypes were a perfect subject for her,” Mr. McElhone said. Initially, the goal was not to recover images, but to understand the chemistry of how daguerreotypes degrade and test the effects of different methods that experts currently use to restore them. As a starting point, Mr. McElhone first offered two daguerreotypes that were made recently to serve as test subjects for Ms. Kozachuk. These were taken to the synchrotron where she was able to use a focused beam of X-rays to deduce the chemical elements present at different locations on the plates. The process, known as X-ray fluorescence, works because X-rays can be tuned to stimulate atoms of different elements, making each glow at its own telltale frequency. Once she had worked out her technique, Ms. Kozachuk then tried her hand at two old daguerreotypes that had made their way into the gallery’s technical collection. These are of no known historic or artistic value because their original sources are unknown and little or no trace of the images they once bore are apparent to the eye. Ms. Kozachuk was able to use X-ray beams to map out the distribution of copper, silver, gold and iron on the two plates. She then wanted to see whether she could detect mercury on the plates, but a beam with sufficient energy was not then available at the Saskatchewan facility. To complete her investigation, Ms. Kozachuk travelled to another synchrotron at Cornell University in Ithaca, N.Y. It was there that the glowing atoms of mercury revealed the images on the plates in exquisite detail, astounding the researchers. The method promises a non-destructive way for museums to understand what information their daguerreotypes contain. It also means that image information can be gleaned and saved before more direct methods of restoring an important daguerreotype is attempted. Ms. Kozachuk added that the project underscores the human motivations behind what was once a leading technology of its day – the desire to capture life and hold a record of it for the future. “For them, it must have seemed as incredible as landing on the moon,” she said.